In terms of recruitment trends, 2019 will bring a fresh set of recruiting trends that will significantly impact your recruiting process. Are you ready to implement them or will you be left behind? We bring you the 15 top recruiting trends for 2019 that you need to start implementing ASAP, otherwise, you will end up being the loser in the war for talent before the year ends! According to research and every recruiter and HR professional everyday work experience, the current job market is 90% candidate driven. That means you don’t pick talent anymore. Talent picks you. Consequently, finding and hiring ideal job candidates, especially those with in-demand skills, has become an extremely hard, expensive and time-consuming. Get our guide for finding high-quality job candidates! That’s why there is a major shift going on in recruiting paradigm. The focus is now on candidates, who are being treated like customers. The change of paradigm brings a whole new set of buzzwords and new recruiting trends. We highlighted 15 most important among recent trends in recruiting that will have the greatest overall impact on the recruitment industry in 2019. Recruitment marketing strategy is based on the implementation of marketing tactics in recruiting. Recruitment marketing is the process of nurturing and attracting talented individuals to your organization using marketing methods and tactics. Recruitment marketing is a discipline that has been introduced as a consequence of the current situation in the labor market. Its main goal is to follow the latest trends in the market and offer solutions to the companies that best overcome these new challenges. Companies that first adopt these new recruiting best practices will be more likely to attract talent. 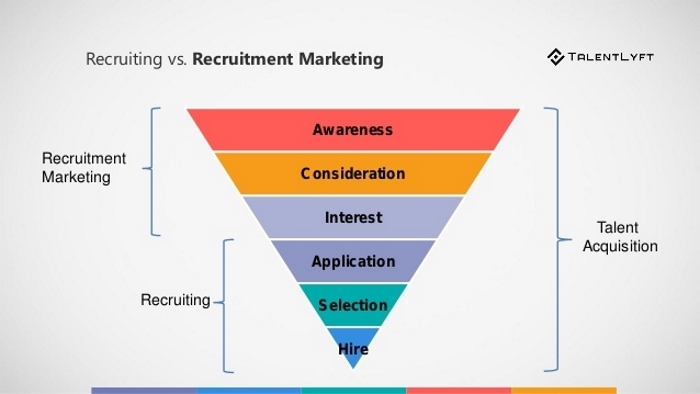 This is why Recruitment Marketing will be at the sole top of the recruitment trends 2019. Inbound Recruiting is a recruitment marketing strategy where you proactively and continually attract candidates with the goal to make them choose you as their next employer. Your goal in inbound recruiting is to attract, convert and engage candidates. Lately, there has been a switch from outbound to inbound recruiting. Simply reaching out to the candidates and offering an open position is not the way to attract talent anymore. If you are looking for a long-term solution to advance your recruiting and hiring strategy, inbound recruiting is the recruitment trend you should adopt. Employer brand is the term commonly used to describe an organization's reputation and popularity as an employer, and its employee value proposition, as opposed to its more general corporate brand reputation and value proposition to customers. Employer branding ideas are essential for building a strong and attractive employer brand. Research by LinkedIn has proven that more than 75% of job seekers research about a company’s reputation and employer brand before applying. Companies with a bad reputation not only struggle to attract candidates, but they also struggle to retain employees. 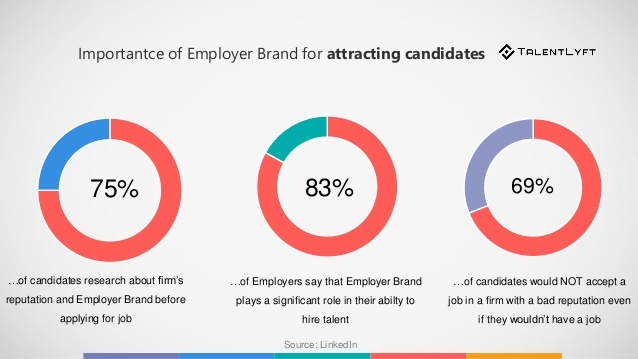 This is why employer branding is one of the top recruitment trends of 2019! “Candidate experience” is current, past and potential future candidates’ overall perception of your company’s recruiting process. It is based on candidates’ feelings, behaviors and attitudes they experience during the whole recruiting process, from sourcing and screening to interviewing, hiring and finally onboarding. Why is paying attention to your candidate experience another extremely important recruitment trend you should adopt in 2019? Because candidates who had a positive candidate experience in your recruiting process will more likely accept your job offer, reapply in future and refer others to your company. On the flip side, a negative candidate experience can cost you more than a few candidates - it can even lose your company big bucks! The most famous example of this is the case of Virgin Media, a company who calculated that a bad candidate experience costs them a shocking $5.4 million annually! Imagine if every time you had a job opening, you had a pool of talent from which you can just pick the best one! Sounds great, right? This is the reason why many recruiters have already adopted this recruitment trend and started building a high-quality candidate database for current and future needs. Candidate relationship management (CRM) is a method for managing and improving relationships with current and potential future job candidates. The importance of candidate relationship management? Having a strong candidate relationship management has quickly become one of the top 2019 recruitment trends. This relatively new method of recruiting was introduced to the world of talent acquisition as a solution to one of the biggest challenges in the HR industry - attracting talent. Social recruiting is using social media channels for recruiting. The term refers to different ways of using social media networks (such as Facebook, Twitter, LinkedIn etc.) and websites (blogs, forums, job boards and websites like Glassdoor for example) to find, attract and hire talent. Social recruiting goes beyond posting current vacant jobs ads on your company’s social network accounts. It offers so much more! You can use social media networks to proactively search for potential candidates, build a relationship with them and encourage them to apply for your vacant job positions. 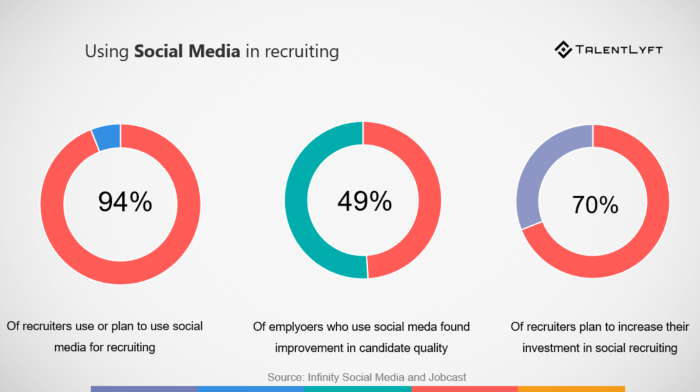 Because of all the possibilities it offers, Social recruiting has become one of the top 2019 recruitment trends. What are recruitment automation tools? Simply put, recruitment automation tools are software that use new technology to automate recruiting process. Automation of recruiting process has been around for a while, but now it will go beyond HRIS, Applicant Tracking System (ATS) and Recruitment Marketing Software. The new trend is software that offer 2 in 1 tools - integrate both ATS and Recruitment Marketing solutions under one platform. These new all in one tools offer help in finding, attracting, engaging, nurturing and converting candidates into applicants. They also streamline, simplify and automate hiring process, making it faster and more efficient. Those organizations that have up till now been too slow to incorporate automation into their recruitment systems are in danger of losing the best candidates to their more forward-thinking competitors. This is why using recruitment tools is successful recruiters' favorite recruitment trend! Looking for recruitment software? Get our guide for buying a recruitment tool! General Data Protection Regulation (GDPR) is a new piece of EU legislation that will replace the current Data Protection Act (DPA) with the goal to unify data regulations within the EU. GDPR will give people greater control over their personal information, which means it will completely change the way recruiting operates in 2019. It will be introduced on 25th May 2018 at which time those organizations in non-compliance will face heavy fines. This is one the most recent trends in recruitment! What are data-driven recruiting and HR analytics? Data-Driven Recruiting and HR Analytics are expressions used to demonstrate recruiting methods in which planning and decision making are based on data acquired through HR technology such as Applicants Tracking Systems and Recruitment Marketing Platforms. Using data-driven metrics is a recruitment trend that can give you some great insights on which parts of your hiring strategy work well, and which ones have room for improvement. Paying attention to your HR analytics and using data-driven recruiting has proven to improve some of the most important hiring metrics such as time to hire, cost to hire and quality of hire. Employee referral programs are definitively one of the most productive ways of hiring talent and filling open positions. 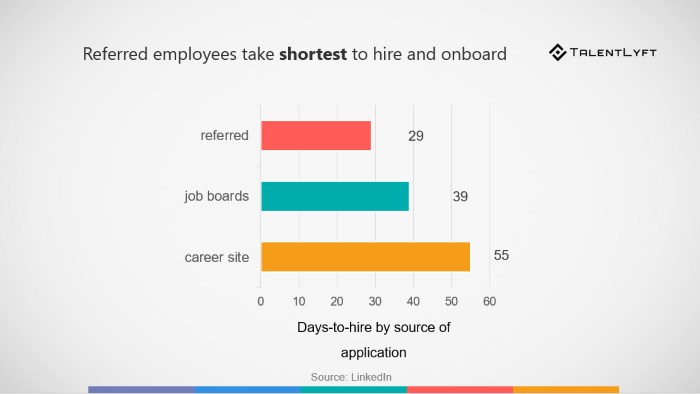 May research has proven that referred employees take shortest to hire and onboard, and require way less money. That being said, we had to put employee referrals to our list of best recruitment trends for 2019! Proactive talent sourcing has become a must-have recruitment strategy. LinkedIn research has shown that only about 36% of potential candidates are job seekers. However, more than 90% of them are interested in hearing about new job opportunities. Collaborative hiring is a hiring method in which both HR teams and teams from other departments work together to find and hire talent. Collaborative hiring is extremely important as it significantly improves the quality of new hires. Consequently, turnover rates drop which positively effects the overall recruitment and hiring strategy. For all of these reasons, collaborative hiring was chosen as top 15 recruitment trends for 2019! Structured interviews are becoming the most popular interview type among many employers. Check out what is the difference between structured, semi-structured and unstructured job interviews. 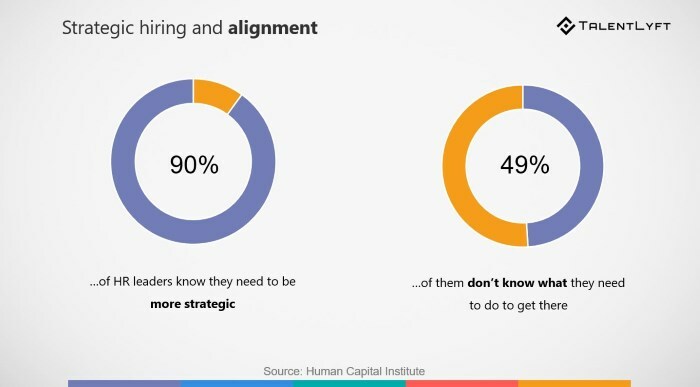 Recruiting and hiring should be aligned with the overall business strategy! As companies can't grow without people, recruiting talent should be more strategic. In order for recruiting to be more strategic, it is necessary to identify company's future needs and goals. Based on that current and potential future skill gaps should be identified. Based on the results, HR teams should plan their hiring efforts to support business growth! The field of human resources is continuously developing and changing. This change is inevitable because of an ever younger and more global workforce. That's why it is important to keep an eye on the latest trends that will affect recruiting industry in 2018. Our TalentLyft recruiting software offers all in one, easy to use Recruitment Marketing and Applicant Tracking System tool to help you find, attract and hire best candidates. TalentLyft Source helps you find and reach best candidates, TalentLyft Engage makes it easy to build relationships with them and TalentLyft Convert encourages them to apply. Finally, TalentLyft Track offers the possibility to monitor your whole recruiting process in one place and provides invaluable analysis, metrics and reports.